Photocopy of first and last pages and the visa page of existing passport. 4 recent colour photographs (identical ones). Attested copies(first and last pages with spouse name on each other's passport) of the valid passports of the parents. Declaration as per the model given hereafter, by both parents not adopting any other nationality in r/o the baby.In case of either parent being a French national, this declaration should to be attested by the concerned Mairie. for whom an Indian passport is applied for. 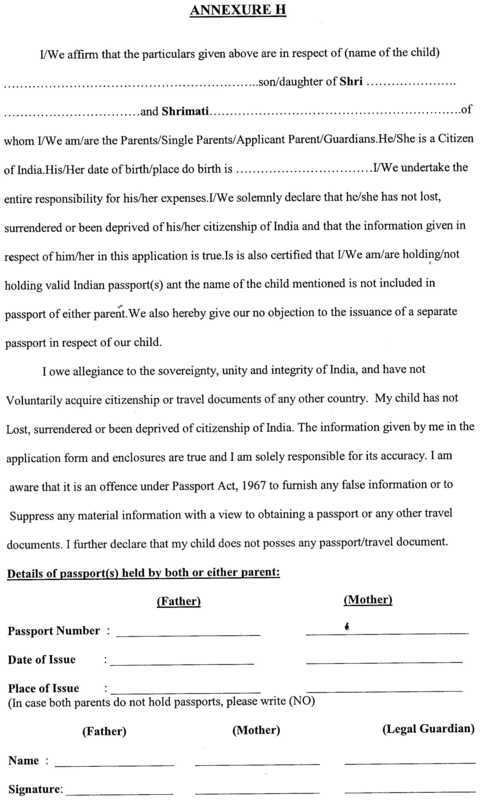 In the event of applying for any other nationality in future, we will surrender the Indian Passport of our child to the nearest Indian Mission/Passport Issuing authority as soon as another nationality is obtained. If the above information is found to be incorrect, action may be taken against me/us according to the Indian Passport Act. We also hereby give our no objection to the renewel /re-issue of existing passport in respect of our child/children. Declaration as per the model given hereafter, by both parents not adopting any other nationality in r/o the baby.In case of either parent being a French national, this declaration should be attested by the concerned Mairie. KINDLY NOTE THAT AS PER THE AMENDED CITIZENSHIP ACT, THE NEW BORN BABY MUST BE REGISTERED WITH THE EMBASSY WITHIN ONE YEAR FROM THE DATE OF BIRTH OF THE BABY. We also hereby give our no objection to the issuance of a separate passport in respect of our child. Photocopy of first and last pages of the lost passport including French visa. Eligible Applicants can do online registration for applying for Passport. Don't use Special characters while entering details in the Online Registration form. Note: Pl note that the application once finalized cannot be modified, so ensure that you are entering the correct data while doing Online Registration. In case if you have finalized wrong data, you have to register again with the correct details and get the print outs with fresh File numbers. Please write/print fields in BLOCK LETTERS. Signature/Thumb impression should be confined in the prescribed box. In case of minor applicants, parent should NOT sign in the box. In case if you haven't taken the print outs in the first time, you can get the copy of the already registered application using "REPRINT REGISTERED FORM" option by supplying the File number (web registration number) and also the Date of Birth. There are still some columns in the application form which you will have to fill by hand. You will have to visit the concerned mission to submit the completed application form along with fee, supporting documents such as date of birth certificate etc.